5:09: Symphonic Dances (1940) by Sergei Rachmaninoff performed by the Atlanta Symphony Orchestra conducted by Robert Spano. 5:46: “Ricordando una melodi olvidada” by Robert Sierra, performed by the Verdehr Trio. 6:08: Three preludes and fugues in B major, F minor and G minor, Op.7, by Marcel Dupré. Performed by Florence Mustric om the Rudolph von Beckerath organ at Trinity Evangelical Lutheran Church, Cleveland Ohio. 6:41 “Snazzy Sonata” by Judith Lang Zaimont. Performed by Judith Lang Zaimont and Doris L. Kosloff (pianos). 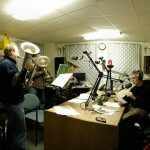 7:08: An interview with Mike Forbes of the Isthmus Brass featuring selections from their new “Isthmus Brass Christmas” CD. 7:30: Finale from Wolfgang Amadeus Mozart’s “The Abduction from the Seraglio”, recorded live at a December 2, 2012 performance by Candid Concert Opera at the Edgebrook Lutheran Church of Chicago. Soloists include Leila Bowie, Diana Stoic, Scott Brunscheen, Javier Bernardom and Neil Edwards. Tom Kastle is the narrator. The chamber orchestra is conducted by Codrut Birsan. This performance will be repeated at Capitol Lakes, 333 W. Main Street, Madison at 8 pm on 12/8. 7:36: “Lo Yisa Goy” (a prayer for peace), a setting by Stacy Garrop, performed by Chicago a Cappella diteced by Jonathan Miller. 7:42: A medley of traditional Chanukah music performed by the Klezmer Conservatory Band, Chicago a Cappella and Robin Spielberg.